Location, location, location! This 150 feet of waterfront will not last long! Ideal location in wide channel off constant level water Lake LBJ, not far from open water. Huge Oak trees and luscious St. Augustine grass on 3 lots. Aesthetic porches built with locally acquired granite. 3 bedroom, 2 bath manufactured home very well kept. Cinderblock 2 boat slip enclosed boat dock with electric lifts. One side adapted for 2 PWCs. Nice cement fishing area. Open water visible from porch. During our historical flood last year, this property did NOT get water to the house and only water in the boat dock with no damage only clean up. 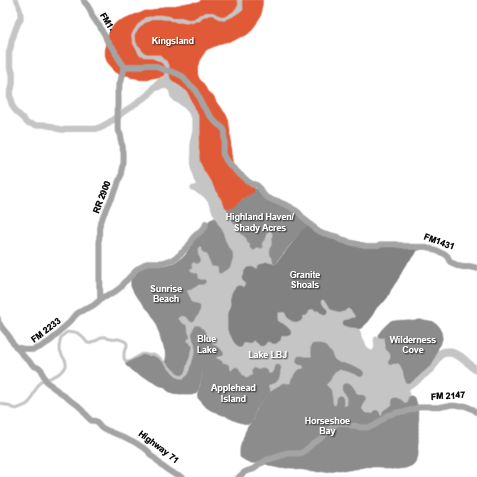 Kingsland is only 45 minutes from Austin and is an up and coming community with many new businesses.